Millions of Americans rely on Social Security benefits to meet their need each month. It should come as no surprise, then, that when social security beneficiaries receive calls from people claiming to be with the Social Security Administration (SSA) telling them their benefits could be in jeopardy, they often provide sensitive and personal information to the person on the other end of the line. The Federal Trade Commission (FTC) reports that the scammers often claim that there is a computer problem and they need you to confirm your social security number. Another variant of the scam that people have reported involves a fake website that seems like a place where you could apply for a new social security card, but in fact it is set up to steal your personal information. Do not trust a name or phone number – Scammers use official-sounding names in order to trick unsuspecting consumers into giving them personal information like a bank account number, Social Security number, or a credit card number. In addition, there is technology that allows scammers to change how their area code appears on caller ID. This means that while a call may look like it’s coming from Washington, DC, it may be coming from somewhere else. 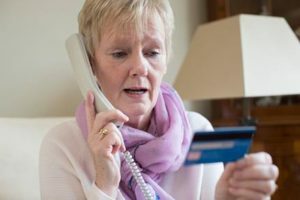 Do not provide the caller with your personal information – As a general rule, you should never give out personal information over the phone unless you are sure about who you are dealing with. If someone has called you, you can’t be sure who’s calling you. If in doubt, check with the Social Security Administration – If you have any doubt about whom you’re talking to, hang up and call the Social Security Administration directly at (800) 772-1213 to verify the purpose of the contact and the identity of the person who contacted you. In the unfortunate event that a scammer has already stolen your identity and you have suffered losses as a result, an attorney may be able to help. Keep in mind that the criminal side of an identity theft case is not designed to compensate you for your losses. For this reason, victims should always retain an attorney to explore their legal options. If you believe that a scammer has stolen your identity, it’s vital that you contact a lawyer as soon as you can.